The following is only an example of a module, a sketch. The modules exist in writing in the diaries of the aspirants and teachers. We are constantly evolving and re-organising the material, based on more than four decades of teaching by the Scandinavian Yoga and Meditation School. We have chosen a module that we call Concentration/Dharana. Dharana can be defined as a capacity to hold a concept or picture in the mind for a certain length of time. A few years ago, we worked with this module from September to April. During that period we also worked with three other modules: Yoga-therapy, Yoga Nidra and Fundamental concepts of yoga. 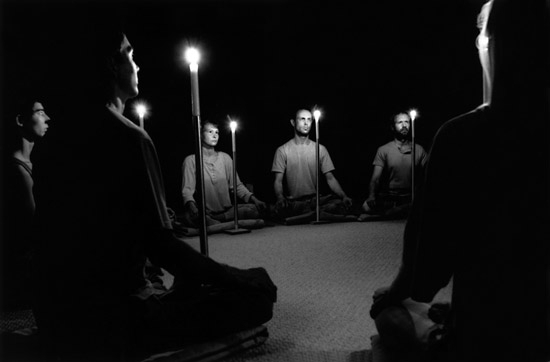 Every day, for the six months period, everyone practised Tratak individually, a concentration technique where, after preparing with other methods, you gaze at the flame of a candle. This practice lasted for 20 minutes, followed by 10 minutes of lying on the back in Dead Still (Savasana). During the yoga teacher seminars in Håå, we also did Inner Tratak, guided by Swami Janakananda. The experience we derived from these practices was used as the basis for our theoretical classes and discussions. From the period of intense practice of Tratak, we gained an insight. The knowledge was confirmed when we later turned to the yoga literature to study this in theory. 4. scientific reports, articles and modern literature. What is the purpose of doing Outer Tratak? How does it influence the state of the brain? What do we know from our own experience of the influence of Tratak on our capacities? What does the yoga literature tell us about this? What is the relationship between relaxation and concentration? Is one possible without the other? Which yoga exercises support and enhance concentration? Which breathing exercise, done right before Tratak, strengthens its effect? How can Tratak increase the awareness in, and the benefit of, Yoga Nidra? What do we understand by the word ‘concentration’ in daily language? How does it influence our state in everyday life when we practice Tratak daily? What experiences did the yoga teachers have individually? How did it help different students (case histories)? What is Inner Tratak; which practices or symbols does it contain; how is it composed, and to what purpose? How can Inner Tratak be made easy, so the student can learn to visualize? What is Dharana – is it just concentration? Is Dharana the capacity to hold a vision in the mind for some time? And in that case, what is the purpose? What Dharana methods do you know? Are concentration and awareness two different things? – gazing at the eyebrow center? – gazing at the nose-tip? – physical concentration on the chakras? – mental concentration on the chakras? – visualisation on the yantras of the chakras? Where is consciousness located when you concentrate on a chakra? – From where do you experience it? – Are there several possibilities? We have been co-operating in a research project with medical doctors in Sweden, to find out how Tratak – together with other yoga practices – may influence the production of the hormone melatonin, and thus our biorhythms and biological clock. Also, an Australian research project has been conducted on this subject. What do the different cultures tell us about concentration and visualisation: the Celts; the Amazon Indians and their superior way of teaching; the Maya literature; the Ancient Egyptian culture? What different cultures have initiation rites that include concentration? What is the relationship between the Tratak practice and a personal psychic symbol? The use of concentration and visualisation in the meditations from the tantric tradition, as taught by Swami Janakananda and Swami Satyananda. What literature can we use in this context – from India, Japan, China and Tibet – and relevant books of psychology and physiology? Forget the darkness around you and look at the red glow on your eyelids. Look intensely on the violet colour. Meditate upon it and imagine that it becomes larger and larger. See a soft shining ocean of violet light around you. You are a wave of light, a ripple of peace on the surface of the ocean. Now pay attention to what is happening. You are a tiny ripple, whirling around on the surface of an ocean of light. Your tiny life is a part of that Life, which pervades everything. As your meditation deepens, you, the tiny ripple of peace, become the vast ocean of peace itself. Meditate on the thought: ” I am a wave of peace.” Feel the enormous sea just below your consciousness. The wave must feel the nourishing life of the vast ocean under itself. (Meditation from Swami Yogananda’s Metaphysical Meditations). >>> to Part three – Education with quality?